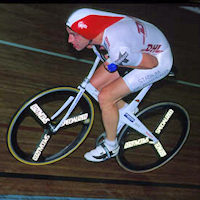 After winning the world championships (4000 m individual pursuit with a world record time of 4’20.9”), there were rumours that Obree would attack the hour record again. Doing some tests in the winter, he made a serious attempt on 27.4.1994. He made almost no changes to his material. (Almost the same bike he used in his 1993 attempt and Specialized trispokes, though trispokes on a closed track is the wrong choice, because they are significant slower than disc wheels (see remarks below)). Obree started very fast, more than 53 km/h. But he could not hold this pace slowing down more and more. But he was never in danger to fall below Boardman’s mark. One can speculate if he would have made 53 km/h with disc wheels instead of trispokes. 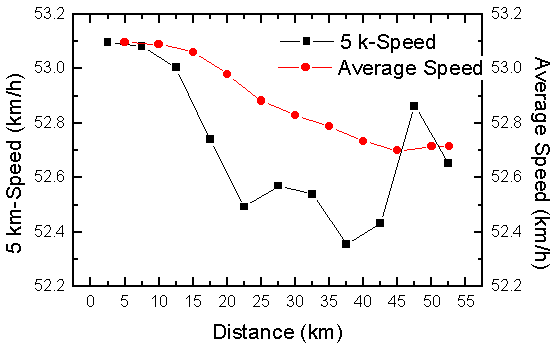 Research of the german TOUR magazine (issue 9/96 and issue 9/93) showed that one can gain about 1.0 km/h (at 52 km/h) by using two disc-wheels instead of two tri-spokes (look at page “motion of a cyclist“, where Spengle-Trispokes were tested). So even with a conservative estimate 53 km/h should have been easily possible.